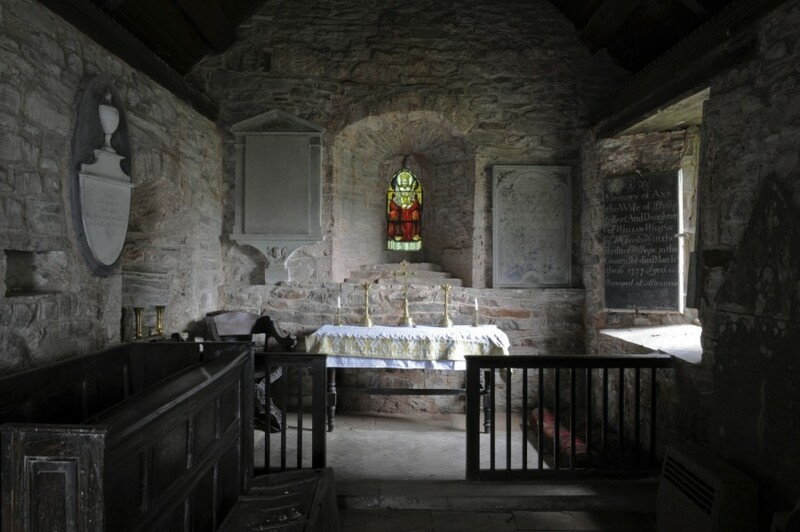 The tiny little church at Llancillo, vested with us in 2007, is probably the most difficult of all our buildings to find – but the search is worth it. And you will be able to get in. The key hangs in the porch but the door is only locked to keep out the sheep. Do remember to lock it up when you go and return the key to its hook. Its name sounds Welsh but it lies on the English side of what is classic Border country. The mound of a long lost Castle is in view from it. The fabric is mostly medieval but like the preaching cross in the churchyard, where only the plinth is original, it was rescued initially, and repaired, a century ago. The parish was transferred from the jurisdiction of St David’s to that of Hereford in 1852, and the dedication is to St Peter, with an apparent alternative dedication to St Tyssillio. Inside the Church – the oldest bell in Herefordshire? Inside the church survives a 13th century bell, believed to be one of the oldest in Herefordshire, although Frederick Sharpe in Vol III (1970) of his Church Bells of Herefordshire suggests it is even older, ascribing it to the second half of the 12th century “as ancient a casting as any found in an English Parish Church today”. The church also retains a 13th century font and a pulpit, mostly of 1632, and an intense East Window placed in memory of Joseph Wheatley, Town Clerk of the City of Cardiff, who lived at Llancillo Hall (a listed early 17th century mansion half a mile to the south west). The window has variously been credited to William Pearce of Birmingham or Jones and Willis. Could you befriend this friendless church? We are looking to establish a group of Local Friends at Llancillo church. We don’t have any ‘eyes and ears’ in the area, so if you live locally – we’d welcome your help. As much or as little as you are able to give. If you’d like to get involved please send us a message via our Facebook or Twitter pages, or speak to Matthew Saunders at the Vestry Hall on 020 7236 3934. Visitors have kindly given us feedback that this church is, to say the least, difficult to find! So we are including here our detailed directions, but if there is anything more you think we should add, please do let us know. The church is reached off the A465.between Pandy to the west and Llangua to the east. Cross over a metal bridge marked ‘Private’, then take a right hand fork – which becomes rough and gravelled but persist. Go through two gates until you come to a gated crossing across the railway. You cross the railway either by stock tunnel (foot only) or level crossing (use of Telephone, compulsory). Over the railway the track goes right then around the breast of a low hill on your left, turning away from the railway and into a tiny valley. Ahead is a farm – cars can be left in the farmyard and the rest of the journey made on foot to the church past the motte. There is a stile into the fields to the right of the large barn. Walk uphill across the field to the church. There is also local access from Walterstone where Monnow Valley Arta Gallery is. And walkers will come across the site as they tackle the Marches Way footpath, which starts from the vaingloriously named Arcadia Farm. Do beware of dogs in the area. The key hangs in the porch but the door is only locked to keep out the sheep. Do remember to lock it up when you go and return the key to its hook (you may need to push the door). Download the Visitors Leaflet – Llancillo Church Guide.